Coco Fusco caused a flurry of locative artists to attention recently with her article Questioning the Frame: Thoughts about maps and spatial logic in the global present . Initially, Fusco's remarks were taken as a complaining negative regarding sentimental longing for the past, prompting one writer to paraphrase her with, "Why isn't [the past] the present anymore?" I would encourage psychogeographers inundated with technology projects, artists intertwined with politically charged work and contemporary theorists regarding artistic interventionist work to consider Fusco's article. I agree with Fusco that contemporary art is pitifully amnesiatic in terms of considering historical context of contemporary projects. Fusco offers a breath of fresh consideration for artists and other critical minds in her closing statements with, "Socially conscious artists and activists, rather than embracing tactics that rely on dreams of omniscience, would do well to examine the history of globalism, networks, dissent and collective actions in order to understand that they are rooted in the geopolitical and cultural margins." As one Locative responded to the article, "Forget WiFi and GPS. Ask for directions." The conversation with backed by technology, a conversation with history rooted in the military-techno-geek algorithm, has not been unheard of in Glowlab's history of Conflux events. Knowing of other artists involved with the technological-yet-conversation-driven works (Lee Walton, Marc Horowitz and PIPS, I am optimistic that artists are on the right playing field. I do believe we are still guilty of not being historically conscious enough, remaining in contemporary social critique without really having a specific nuance to critique. Therefore, Fusco's words tell us to pursue the rules of the playing field before we start playing a game of unfocused banter. News and information about resources, aid, donations and volunteer efforts: The South-East Asia Earthquake and Tsunami blog. "New York Is So Crowded, Everybody's Deserted It." "Office of the Future" or FREMTIDENS KONTOR by N55 has been happening for a little while now and is coming together quite well. Talks have been presented regarding use of space, the building of identity and copyright issues. The collaboration is driven because of Copenhagen's lack of residencial space, but abundance of office space. "It’s pretty stupid. Fortunately, it’s easy to do something about it. If there’s going to be offices everywhere, then we can just decide for ourselves what an office is." PIPS' publication Crosswalk is holding a formal call for entries. This issue asks for articles regarding the vessel of art as a means of alternative interpretation of the everyday. These "Space Ships" are focusing (but not limited to) Free Culture, Collective Practices, Ransoms on Space, Interventionalists Diaries, Public vs. Private and contemporary nomadism. Entries are accepted to the end of January. Please visit the website for submission details and publication contacts. FIREHOUSE 13 in Providence, RI is hosting Greetings from the USA Friday Dec 17 from 7-12. The works range in social critique of America to simply being work about American traditions. Paintings, prints, furniture, ceramics and performance with a DJ and cash bar will fill the night. More information can be found here. Directions: from eastside Providence : atwells ave, left on service road 7, right on broad st, right at pearl st (stop light) left on central. from 95 N : Broadway Exit, left at light, left on service road 7, follow driections above. from 95 S Atwells Ave Exit to service road 7, follow directions above. $5 Donation at the door, $2 drinks, $1 beers. All proceeds to to Firehouse 13 and Art Recreational Center. Glowlab founder Christina Ray recently collaborated with her father for a show in Santa Monica, CA called Artist Inquiries II: Street Parking in Los Angeles. 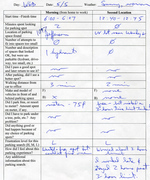 Ray and her father designed an informational sheet that was supplemented by photographs and drawings to depict the Los Angeles stresses and excitement in the pursuit of satisfactory parking. Details regarding the questionnaire and the artist statements can be found at the site under Artist Inquiries II: Street Parking in Los Angeles. This project questions the urban landscape and the design of the personal use within that landscape. In Ray's artist statement she describes the ease of mind by not having a vehicle in Brooklyn thereby relieving her from worrying about "auto insurance, the price of gas, or alternate-side parking restrictions". Indeed, living in New York and even Providence, RI myself, the design of the urban landscape is more condusive for promoting walking. In fact, whenever I am in New York, I intentionally leave my car behind because there is no need for one. By contrast, when I recently lived in California I experienced first hand the necessity for a vehicle, even to go around the block. It wasn't so much that I became lazy when I lived in California, but that the area did not allow for me to comfortably walk from one location to another. Ray touches upon this design difference in her statement, "As I received the photographs [from my father], I compared the tree-lined streets and clean sidewalks of Los Angeles to those of my own neighborhood. Over the past few years, I've photographed and made drawings of various cars and trucks on the streets of Brooklyn. The contrast between the two locations is significant." The contrast in the urban landscape is indicative of the American urban design evolution. Eastern towns developed while neighborhoods were the vitality of a place. Western towns developed a tad later, but late enough that the automobile became the staple of the place, removing neighborhood from number one priority. Suburban Nation by Andreas Duany, Elizabeth Plater-Zyberk and Jeff Speck directly address this design evolution and attempt counter designs to the sprawl developments. Although I cannot agree with their criticizm of architecture, I can agree with them upon the vitality of neighborhood design and the importance of maintaining its precesnce in contemporary urban landscapes. The documentation provided by Ray and her father show a first person account of a specifically designed difference in the ways in which we live because of a difference in the priority of land usage by designers. Ray and her father, through a study of daily routine show how perception of place and conscious realization of the routine reveals the nuances that create that everyday environment. Within realizing this environment, we understand why we appreciate and therefore undestand the desires for inhabiting that space. We know the differences of urban space design, but we understand further how we chose to plug into that design. The work is politely engaging, allowing the viewer to generate their own realizations one way or the other, therefore allowing the work to equally engage car-based or neighborhood-based audiences. The project is able to sucessfully engage these audiences because it is created from different areas of perception. While Ray is intensely looking at urban land use and design, her father regards the spaces he occupies as his everyday environment, although now he engages this environment with acute detail for time, place and situation. The choice to display the two perceptions with both visual and literary based mediums further displays the collaborative effort put forth in the father-daughter team and lets an audience know this type of observation is possible no matter how far apart we are. This Friday, Dec. 3rd Sifting the Inner Belt would like to invite you to the first performance intervention as part of their "Bridging Series." The "Bridging Series" takes place in the South End neighborhood creating direct and indirect "bridges" between the Boston Center for the Arts and the Berkeley Street Community Garden, both of which are long-standing neighborhood institutions. The series coincides with select South End "First Friday" gallery openings. The performances take the form of "instruction works" requiring audience participation. Directions/instructions for the performances will be available at the plaza in front of the BCA Mills Gallery, while the performances may take place in various locations throughout the South End. These performance interventions will take place, rain or shine (or snow). Sifting the Inner Belt is a year-long social performance and research art project that consists of a series of performance interventions and performance-based research projects, which closely observe and examine, i.e. sift, the South End neighborhood with an emphasis on creating emotional, conceptual and physical bridges between the Boston Center for the Arts (BCA) and the Berkeley Street Community Garden (BSCG). This project was developed as a collaboration of artists, activists and community residents: Jeremy Chu, Catherine D'lgnazio, William Ho, Hiroko Kikuchi, Jeremy Liu, Natalie Loveless, and Kim Szeto. An exhibition based on and documenting Sifting the Inner Belt is scheduled for the Mills Gallery from June 17 to July 31, 2005. Saturday Dec. 4th and Sunday Dec. 5th Small Press Center in Manhattan is hosting a free fair for independent publishing. Sunday Dec. 5th @ 4 PM there is a panel discussion taking place at the with Glowlab friends Streetmemes.com and RELAPSED.NET being represented.